If you have ever been at the bleachers in a baseball stadium, you might find yourself in a situation where you are sitting on a simple bench with no back. Or maybe you're watching a college basketball or football game, and the “seating” is just a plain wooden bench. You can't take a beach chair or lawn chair with you to a stadium. If that's the case, a stadium seat is a great convenience. It's a portable cushion that offers support for your back--that’s important at a sporting event, when you may be sitting for 2 or 3 hours at a time. You can find stadium seats with or without armrests. There is a nice variety of features in stadium seats, and it's worthwhile getting familiar with them. With arm rests: There are stadium seats that have pop-up armrests as well. 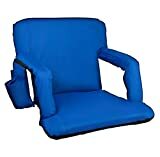 That's an added convenience, but the Picnic Time armchair allows you to collapse the arms, so you have more place to sit. 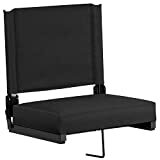 Good in other places as well: There are stadium seats that you can use at the beach, the pool, or at picnics, besides using it at a baseball game. Some even use it while sitting at home watching TV or playing a video game. Comfort: Some say that their chair is okay for offering back support, but perhaps is still uncomfortable if you have to sit for hours. Look for the models that offer extra padding, such as the Mackwort Patented Deluxe Wide Model Stadium Chair. The Picnic Time seat has extra foam padding, which insulates you if it's cold outside. The Stansport Padded Stadium Seat has as much as 3.5” of cushioning on their seat, making it a comfortable choice. 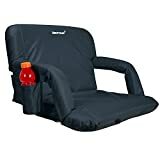 On the other hand, if it's warmth that you need, the Tranquilease Club seat even has a rechargeable heating element inside! Weight support: It's important to check how much weight your stadium seat can support. The Markwort Wide Model Stadium Chair can support up to 400 pounds. 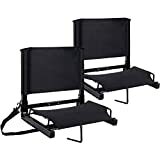 The GCI Outdoors Bleacherback Stadium Seat and Picnic Plus Wide-Width Stadium Seat are not so sturdy, but they can still support up to 250 pounds. Assembly: The Markwort chair comes with two screws, to attach the back of the chair to the seat. It takes maybe 10 seconds to assemble the chair, but it's a hassle if you lose the screws. Price: The prices of stadium chairs vary between around $20 to $60. 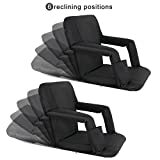 The Multiuse Adjustable Recliner Stadium Seat by Trademark Innovations is surprisingly versatile for something as inexpensive as $20 since it can serve as a recliner as well. Oniva's Picnic Time Portable Ventura Reclining Stadium Seat is the top of the line--you can expect it to cost around $60. Adjustable armrests and backrests: The Picnic Time Ventura Seat has 6 backrest positions. The armrests can be extended upwards, or you can choose to collapse them, to allow more space to sit. The Stadium Chair GameChanger seat has arm rests that are sold separately from the chair. Portability: The Picnic Time and Naomi Home Venice Portable Reclining Seat have backpack straps so that you can carry the seat on your back while walking. This way, your hands are free to carry something else. Other models have a shoulder strap, which is also convenient. The Coleman Stadium Seat has the advantage that you can roll up the seat like a sleeping bag and stuff it away in a backpack. Water-resistant bottom: Since the bleachers where you put your stadium seat might be wet, it's good that the bottom of the fabric is water resistant. Oniva's Picnic Time Portable Ventura Reclining Stadium Seat is supplied with such a waterproof seat. The number of positions: Oniva's Picnic Time Portable Ventura Reclining Stadium Seat has six adjustable settings, to allow you to sit upright, or to recline in a number of angles. Pockets: A nice feature on a stadium chair is having a few pockets. 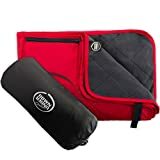 You can use it for storing away a program or yearbook, raincoats, jackets, programs, or for personal belongings (such as your keys or cell phone). Oniva's Picnic Time Portable Ventura Reclining Stadium Seat has a zippered pocket in the back, to put some extra belongings. The width of the chair: You'll want to pay attention to the width of the chair so that you can be sure it's comfortable. The Markwort Patented Deluxe Wide Model Stadium Chair is 17 inches wide--but they also make a 20” wide version. Some chairs, like the Coleman Stadium Seat, have straps on the sides that hold the seat together with the back. That reduces the width of the chair since you’ll have to sit between the two straps. But you can also unbuckle them, to allow more room to sit. Dimensions when folded: Since you’ll be taking your stadium seat to the ballpark, you don’t want something too big when trying to negotiate through a crowd of people. So it’s important that it folds up conveniently. Cushioning: The Stansport Folding Stadium Seat with Armrests is padded with polyurethane foam. The seat is 3.5” thick, which is distinctive among stadium seats. It will provide comfort even for the hardest benches. Hooks securely onto bleacher bench: You want to make sure that the stadium seat fastens onto the bench securely. For example, the Stansport Folding Stadium Seat with Arms has a steel hook on the bottom, so that you can secure it to the bleacher bench. That will ensure that the seat doesn’t slide. The GCI Outdoors Bleacherback Stadium Seat attaches to the bleacher with a single buckle--just snap them in place and adjust the length. The Academy Stadium Seat, which costs as little as $12, has a clip that attaches to the bleacher bench. But customers were not pleased with the durability of the clip--they found that it bends out of shape after just a few uses, and doesn’t secure the seat properly anymore. 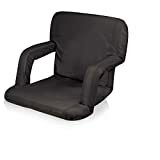 Durable frame: A stadium chair that has a metal frame with canvas will only be as durable as the frame. A steel frame is the best assurance that it will maintain its shape over many uses. A tubular frame will ensure that there are no sharp edges that can cut into the canvas seat--that will also ensure the product’s longevity. But there will be limits as to how much weight the frame can support--check the weight allowance that the manufacturer suggested. 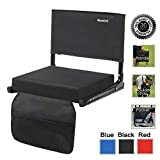 Portability: If you want a portable stadium seat, you want to make sure that it collapses down to a compact size, but also that the seat itself doesn’t weigh a lot. The seats with steel frame tubing will be more durable, but will also weigh more. The Stansport Folding Stadium Seat with Armrests weighs around 20 pounds, which is on the heavy side. The Picnic Plus Wide Width Stadium Seat weighs 8 pounds, which is significantly more manageable. Personalized stadium seats: Some companies, such as the Stadium Chair Company, allow you to personalize your stadium seat. You can get them in the colors of your college or professional sports team, and put the team’s insignia on the back. Picnic Time—are makers of camping and outdoors goods. They make stadium seats, sports chairs, picnic baskets, tote bags, and coolers. Their stadium seats are adjustable to a number of reclining positions. Markwort—are sporting goods manufacturers located in St. Louis, Missouri. They were founded in 1901, and are a family-run business. They make softball and baseball equipment, uniforms, and training accessories. 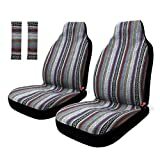 Besides making a standard stadium seat, they also make an extra-wide seat, as well as extra cushions for backing. Stadium Chair Co.--are makers of stadium chairs, sideline chairs, locker stools, and cushions. They are located in Midland, Texas. Their stadium seat hooks onto any type of bleacher bench and has rubber non-slip skids. Coleman-- is an American company started by W.C. Coleman in 1905 in Brockton, Alabama. He originally started manufacturing gas lamps, but soon expanded to outdoor gas stoves, and then eventually to an entire line of outdoor recreation products: tents, sleeping bags, camping furniture, backpacks, chairs, and more. Stansport--is an outdoors goods company, based in Los Angeles, California and founded in 1952. They make camping, hiking, outdoor recreation, and survival goods. They make tents, sleeping bags, backpacks, pouches, outdoors apparel, camping furniture, and much more. 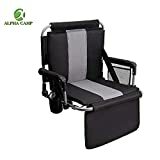 They have a wide selection of foldable chairs as well: multi-fold padded arm chairs, go-anywhere multi-fold padded seats, stadium seats with arm supports, and coliseum seats.